Announcement STUNNING MODERN QUILTS with EXCEPTIONAL SERVICE. Ten years of Personalized Quilts. Current lead time is about two weeks for most items. Each item is customized by you and 100% handmade by me. I work with each customer to provide exceptional service and products. I love working with people to create something custom and unique just for your baby. I am a message and custom request friendly shop. If you have an idea, please contact me to see what we can create for you! I offer quilts and quilted items for baby, household items, holidays, special occasions with custom twists that turn the ordinary into stylish. Convo me for a custom quote! Additionally, I love to Personalize! Most everything can have personalization added, if not specified send me a message! I can do custom orders on various quilts. I would love to tailor your order to suit your specific needs, tastes, and design. I ship via USPS with Delivery confirmation/Tracking. ALL INTERNATIONAL ORDERS COME WITH CUSTOMS TRACKING INFORMATION. Convo me for a quote to your country. STUNNING MODERN QUILTS with EXCEPTIONAL SERVICE. 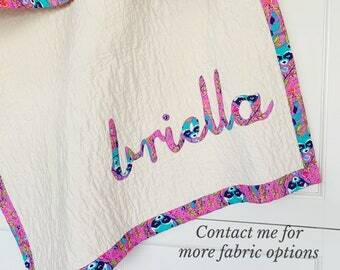 SALE Personalized Toddler Quilt from Baby Clothes. 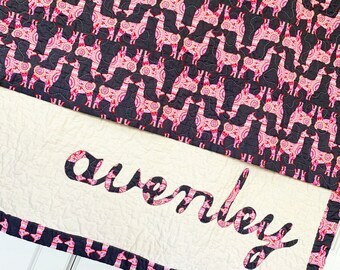 SALE Rifle Paper Baby Quilt With Extra Name. So in love with this quilt!!! Beautiful and so soft! Gorgeous quality and amazing customer service! We will love this quilt for years and it is just so special! We chose the crib size and it is perfect! Give me All the plaid and checks for the babies! Now offering THROW size quilts! Let me know your style and colors and I will send you fabric choices! Only high quality materials will be used on your handmade items. Cotton and natural fibers hold well up over time! Every letter is hand cut from the fabric to optimize placement and arrangement. Great care is taken with each step. Thread is carefully selected to coordinate with your custom fabric choice. All names are hand drawn, hand cut and carefully appliquéd to the quilt top. Loads of care and detail go into this step. I learned to quilt by hand when I was 14 from my great aunt. She sent me a little box with everything I needed to get started, then invited me to her home for a summer stay to learn more. My love of quilts began there, and when I had my own children my affection of personalization blossomed. I've become discriminating in my own tastes for personalized items. I tend toward the loving touches that come from handmade items. My quilts are made one at a time. Each letter of each name is drawn and cut by my hands. It is then carefully appliquéd onto the solid cotton, from there, it is quilted by me in my studio. I take great care to utilize the fabric you have personally chosen to position it just right. Great detail and care are given to this slow albeit rewarding process. 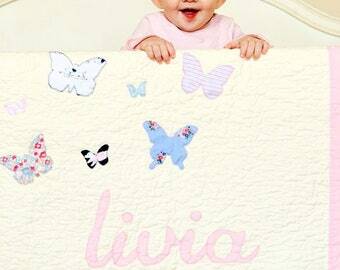 I love quilting and personalizing baby items in this manner. My own children spend hours snuggling their quilts and looking at details. I want each baby to love their quilt, enjoy seeing their name and connecting with the loved one who blessed them with the it. Wife to my best friend, mother of three blessings, called to glorify God with all that I am and all that I do. Hey there, welcome to Tracy Bug Creative, quilted and handmade goodness! I'm Tracy and I first learned to quilt by hand from my geat aunt over 20 years ago. Thanks for stopping by. It is my pleasure to work closely with you to design and create the perfect item. If you are interested in a custom item or like what you've seen and would like something similar please convo me and together we can create something great for you. Most all of my items can be personalized, let me know if you are interested. I strive to create items that are of high quality. Please note that handmade items have slight variations. That said, your satisfaction is very important to me. If you have issues or problems please contact me. Personalized items will not be refunded unless there is an issue with workmanship. I will offer a refund or exchange on unused non-personalized items within 7 days of delivery confirmation. I cannot offer a refund on shipping charges. Please pay via paypal promptly to ensure prompt shipping. I ship via USPS first class mail with delivery confirmation, orders over $50 include insurance. If you would like it sooner please contact me for an upgrade. Please convo me if you need international shipping. Custom Personalized orders placed after Nov. 13 are not guaranteed for Christmas delivery.